Smoked Garlic Cloves bring an additional dimension to many dishes. There are two methods of smoking Garlic, Traditional Oak smoking required the cloves to be hung in the kiln for 2 days during which time the smoke permeates the Garlic to give a rich and characterful flavour. 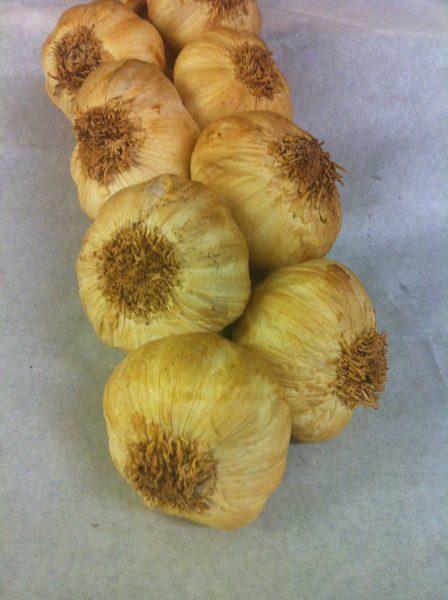 Hot smoked Garlic cloves on the other hand, provide a real treat for the chef and the diners. The Garlic cloves are smoked at about 90 degrees for 4 to 5 hours during which time the clove pods turn to paste. They can then be separated from the main clove and dropped into the dish or spread with a knife. It's a variation on an old chefs trick by gently cooking the whole clove (confit) its always ready, and with hot smoking it there is a added character to the Garlic. Two whole cloves either cold smoked or hot smoked.